I remember the first portable fishhouses to hit the ice. Mere canvas stretched over makeshift aluminum poles bolted to primitive plywood frames, they nonetheless got us out of the wind and cold. Today, portable fishhouses are lighter, offer more fishable space, and many are constructed of space-age materials for resistance to the elements and greater R-values for warmth. 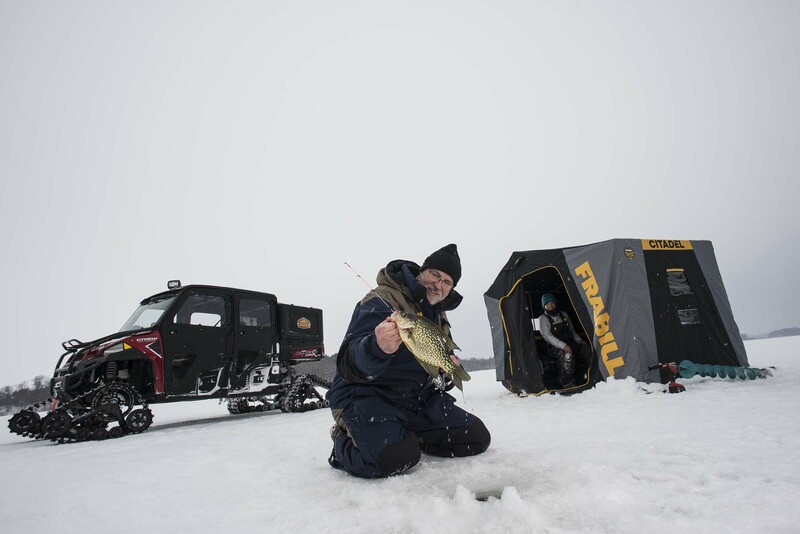 But fishing from portable fishhouses still presents challenges, so we ice anglers are continually looking for better, problem-solving shelters – not to mention customizing them with our own modifications. One of my biggest pet peeves with portables has been pole design. Fact is, you’re never colder than when you have to shut off your heater and start breaking the house down at the end of the day, and have to throw it in the back of the truck or hitch up to the ATV or sled. You take your gloves off and push those little buttons on the poles and by the time you get that done you can’t feel your fingers anymore. Now, with Frabill’s re-design, you’ve got poles that are easy to adjust with your gloves on, which is a feature I really like. The other thing about poles is many are prone to failure, which is frustrating. Solving that problem, Frabill’s new allow frames are 30% stronger and 30% lighter than traditional aluminum frames. The result means easier transport, setup and storage –and practically fail-proof operation. Seems like seating has always been an issue, too, especially when fishing with family or buddies. There’s just never enough space. For that very reason, I’ve been fishing out of the Citadel 3405 this year, which features Frabill’s proprietary Combo-Case Bench design that will accommodate three anglers with room to spare. do that. It’s also super comfortable and you can position where you want to be on the bench, especially great for fishing with other anglers; even better for fishing with kids. 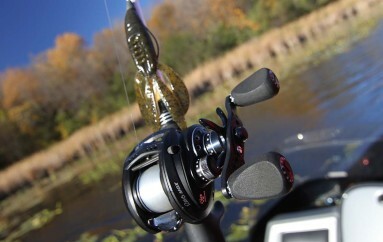 Frabill’s Combo-Case Bench design solves another common problem: rod storage. 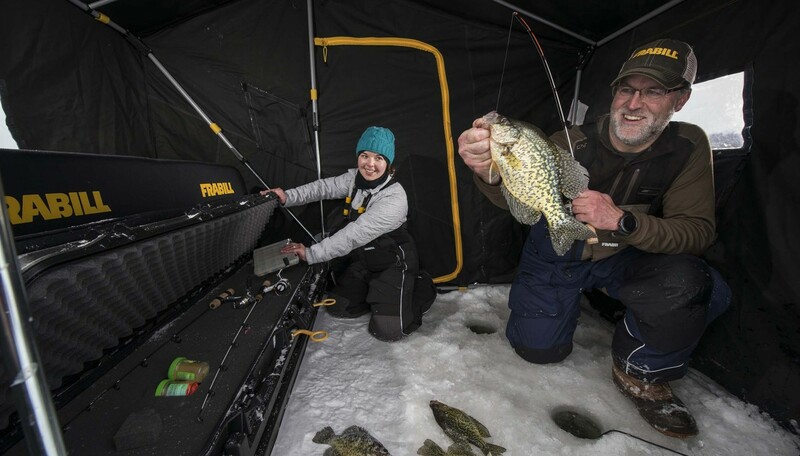 It’s actually built on top of the same heavy-duty roto-molded case many outdoorsmen use as gun cases, complete with pick-and-pluck foam to customize perfect fit slots for your favorite (and probably valuable) ice fishing combos. By cutting out foam with a serrated knife the case easily accommodates six combos; more if you use shorter rods. But here’s the thing: you can easily transport 8-10 ice combos in Combo-Case bench without cutting any foam! 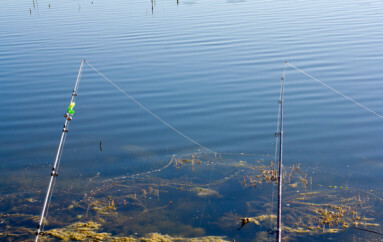 Either way, rods stay secure, untangled and easily within reach. I don’t know how many times I’ve pulled out a house, only to find out that a propane tank or some other heavy item shifted and crushed a rod or two. Frabill’s combo eliminates that. Frabill’s Citadel also offers a giant fishing area. You don’t realize how giant that is until you get in the house and ͞My gosh, I’ve got room easily for three people!͟ My Citadel 3405 features nearly 30 square feet of fishable space, but what makes that even larger is Frabill’s unique SideStep Entry with a door on each side rather than the standard front door design of most flip-overs. Available exclusively in the Frabill Citadel and Predator families, I can tell you the SideStep design flat-out eliminates a lot of hassle, like your buddy knocking over the heater, portable fishfinder, or getting wrapped up in line. The design simplifies in-and-out access, removes the need to step over gear and holes, and a vertical front wall design provides more room for hooksets with today’s longer rods and reduces the risk of heater damage. Lastly, Frabill re-thought window shape and placement. The new window has a parallelogram shape, which provides greater viewing space to keep an eye on nearby tip-ups. In a word: smart. 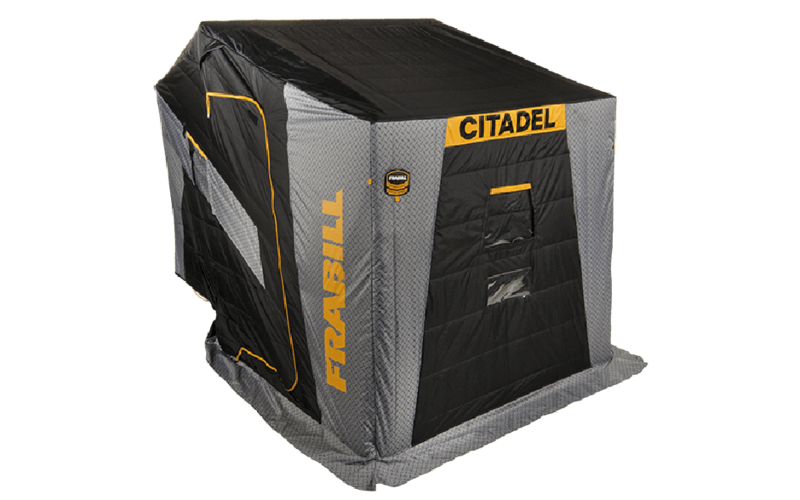 So, if you’re looking for a portable fishhouse that will last longer, eliminate hassles, and has fishability in spaces, look no further than the Frabill Citadel series. Breaks Line, Catches Fish Anyway? ?